I was happy to learn that Cooties #11 was nominated in the Comics category for the 2018 Association of Mormon Letters award! Feels nice to be noticed. While unrelated to anything noticeably Mormon, the theme of the issue, sibling relationships, was heavily influenced by both my Mo upbringing and my experience as a parent. Just having my name mentioned in the same category as such great people as Jake Parker, Brandon Dayton, Noah Van Sciver and Brittany Olsen is such a huge honor for me. It blows my mind that putting the challenge to myself to produce an entire comic issue in 30 days has resulted in this kind of reception. I’m more stoked than ever to keep producing stories for this series! I’ve finished another design for my Nerdy Storybook Covers print series! 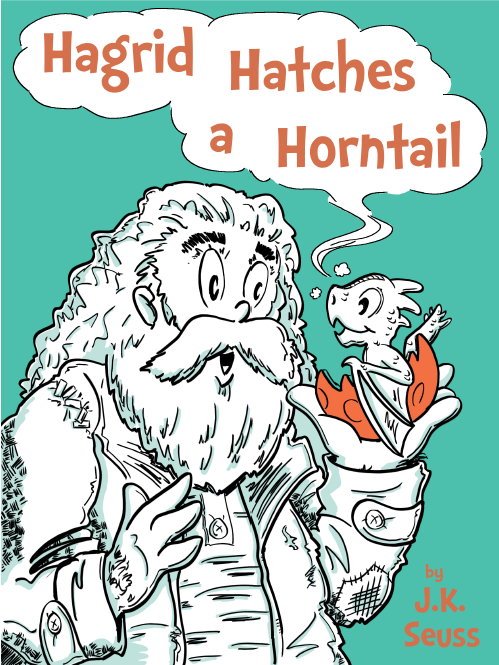 Combining Harry Potter and Dr. Seuss. I think it works! I’ll have these available for purchase at FanX in April. Happy 2019! Just a quick update: I’m currently working on the script for Cooties issue #12. Before I go into production on that, though, I’m working on a sequel to my short story The Classroom Curses. It will be 12 pages, and included in the SpiderForest Collective‘s 2019 Webcomic Anthology, currently titled “Haunted!” I’ll announce the Kickstarter for the project when it goes live later this year. I’ll keep you all posted as to when you can expect to see new Cooties content. As always, thanks for reading! Anybody wanting a print edition of issue #11 can get a copy here. Print editions of all my comics can be found here. 3 years ago, I completed a 10-chapter-long story arc, running almost a decade and 200+ pages. That’s a hard way to build an audience. A 3-year hiatus is even worse. After all this time, I have finally come to the conclusion that this comic and these characters will always stay with me. And I want to share them for as long as I’m able. Will I become rich or famous from it? No. And that’s fine. I love my day job, but it is still a personal mission for me to create professional-quality work; just not necessarily for a company any more. I want to create art for me, and for anyone who might enjoy it. So, here’s the new status quo: I will create this comic 1 22-page issue at a time. When the issue is done, I’ll put it up for sale on IndyPlanet, for those who would like the whole thing in print, with extra print-exclusive content inside. At the same time, I’ll be updating the site twice a week, on Mondays and Thursdays. There may be a small hiatus between issues, but I will continue to keep you posted with progress on the next one. As of now, issue 11 will be posting with Page 1 on Thursday, September 13, and will run through the end of November. Where issues 1-10 were a continuing story, think of issue 11 more as a stand-alone sitcom episode. It’s mostly jokes and some character development, while I work on the next big storyline. I experimented with a limited color palette for each scene; I’m not sure if I like it. I know I will definitely be going back to full-color for the next long-form story. Without further adieu, if I even have any readers anymore, here we go!